At the risk of outing myself as a gamer who doesn’t play “enough” games, let’s talk about my gaming stats for 2017. I started logging my plays on Board Game Geek late 2015 and I’ve found that I’ve enjoyed the practice. Besides the inherent joy in collecting and organizing data, I’ve found this practice to help ground my understanding of how much I actually do play games. My goal in 2016 was to log at least 365 plays, which, with the help of a lot of Netrunner, I was able to do. I played slightly fewer games in 2017, but about half the amount of Netrunner (I’ve been on a hiatus for a few months), so excluding that game I played a bit more frequently the past year. Looking over the stats, I found quite a few surprises. But let’s start with the heavy hitters–my top 10 most played games of 2017! Three brand new 2017 releases are tied with 6 plays each. What a pleasant grouping of games, all with light, cheery art in their own unique ways. 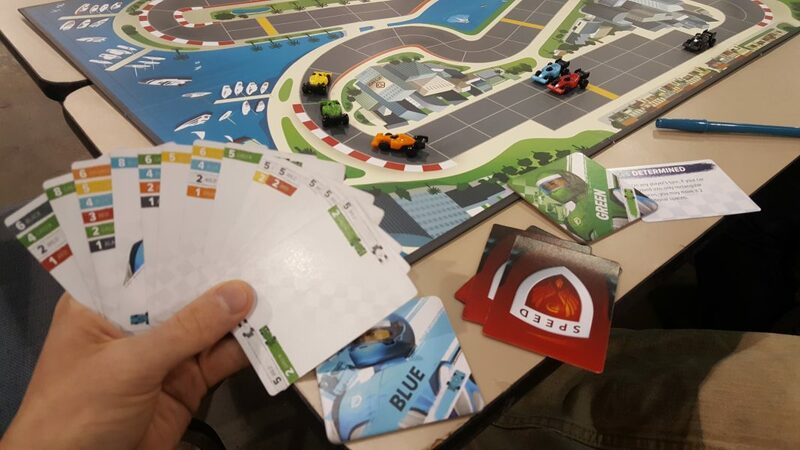 Downforce was a discovery for me in November, and I’ve pulled it out essentially every time we’ve only had 30-45 minutes for a multiplayer game. I think it’s great. Near and Far was the game I was most excited about going into 2017, and I had a blast at first, but after completing the character campaign I was sort of done with it. Strategy had become rote, and while the story bits were clever and well written, they weren’t quite engaging enough as an overall narrative. It was a board game that also had story instead of a board game with story. I do need to go back and finish the full campaign where you go through each individual map and finally get around to reviewing it. I was surprised to see this among my most played games with 7 plays, but I suppose Friday has become somewhat of a safety blanket for me. It’s the only solo game I really play, and I find it a nice, calming experience. I generally play more than once per sitting, pushing my luck and skill against the brutal difficulty scaling as much as I dare. I don’t think there’s as much talk about it anymore but it’s quite fun. Two games I might not have ever heard of without The Thoughtful Gamer. Two quick card games in small packages with interesting art. Two completely different experiences. Riftwalker makes it this high because it’s become part of my standard 2 player card game repertoire. Outpost: Siberia because I kept playing all 6 players solo trying to figure out if I could be beaten. It could not. 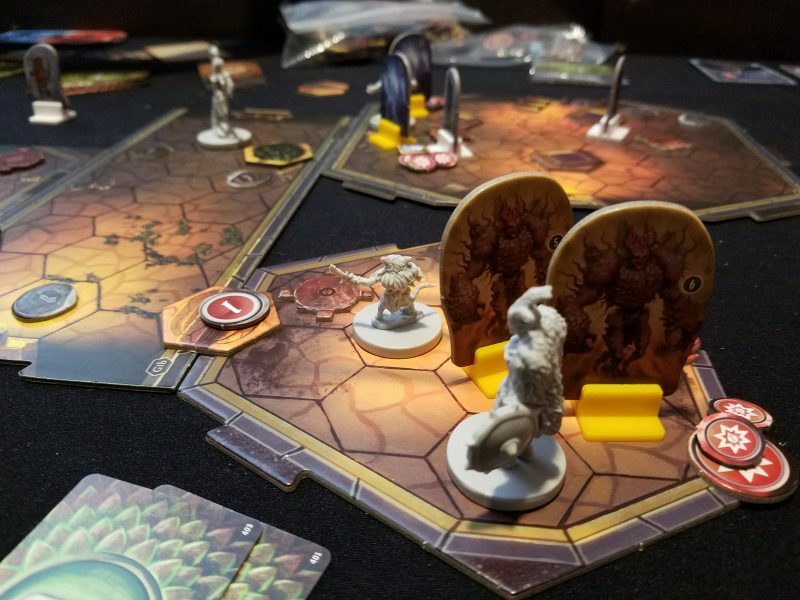 I played Gloomhaven 10 times in 2017 and I look forward to playing it about 50 more times in 2018. I want to finish the game. I want to dive into it and swim around. It’s so good. Codenames barely beats out Gloomhaven with 11 plays, and every single one of them came at some kind of party or gathering. It’s the best party game I’ve ever played and it works well in so many kinds of situations because of no hard cap on the number of players and how easy it is to drop in and out. I’ll be playing this for years. After some moderate optimism about the game followed by some concern that certain strategies might be annoyingly powerful, we finally got hooked on this one for about two weeks and played 14 times. We played multiple times back to back and explored different strategies each time. I love all of the tiny dice and how quick and addictive it is. I don’t know if I’ll play it as much this year, if only because that discovery phase has passed. Still a great game. As much of an “evergreen” game that can exist for me, Dominion got a lot more play once we figured out an organizational system that works well. I still haven’t been able to play the Nocturne expansion, though hopefully that will be remedied soon. Not counting dozens of games online, I played Dominion 17 times in 2017. 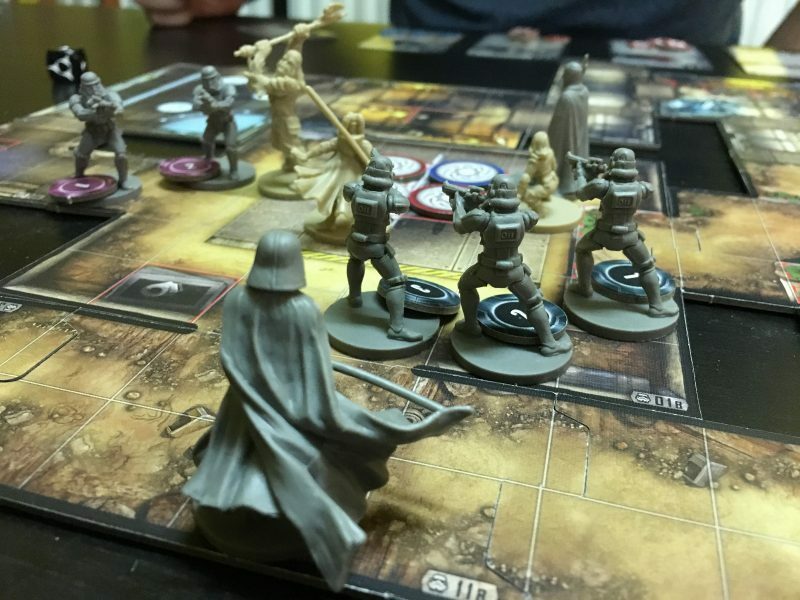 Sometime in January we decided to go through an Imperial Assault campaign. A few months later I started another campaign but only got part way through. Combined that resulted in 23 games of Imperial Assault, enough to make it my 2nd most played game of 2017. Now that I’ve got Gloomhaven I don’t know if I’ll even get to IA in 2018. I don’t think Gloomhaven will completely eclipse it, but I’m going to need to be in the mood for a more zany dice-rolling time before I resume the IA campaign. I played 65 in-person games of Netrunner in 2017 and nearly all of them were in the first half of the year. I still adore the game, but I have so many board games to play that I decided to take a break for it until after the new core set and rotation settle in. Of course, I still have a lot of board games to play, but I know I’ll get back to it. Unless I find another similar game I like better, I suspect that Netrunner will top the list again in 2018. My most “productive” month of 2017 was August with 36 plays, due primarily to playing a lot of Dominion (that’s when we re-organized everything) and alternating frustrating solo games of Outpost: Siberia and enjoyable games of Friday. My least productive month was April with 21 plays, though I don’t note any interesting trends there other than no Netrunner. I played a lot of games once and the most played game that month was Codenames, which I played thrice. Among the games I only played once, the ones I wish I’d played more are War of the Ring, Triumph and Tragedy, Millenium Blades, Galaxy Trucker, Dominant Species, Colonial Twilight, and 7 Wonders. All of those are great and a combination of time/complexity and uninterest among other people kept them mostly away from the table. I only played my favorite game, Twilight Struggle, twice in 2017, though I did also play a handful of times digitally as well. I was more concerned with getting games like Falling Sky (3 plays) to the table for that political fix and when deciding on a meaty two player game it has to compete with games like Mage Knight and Star Wars Rebellion (4 and 3 plays respectively). 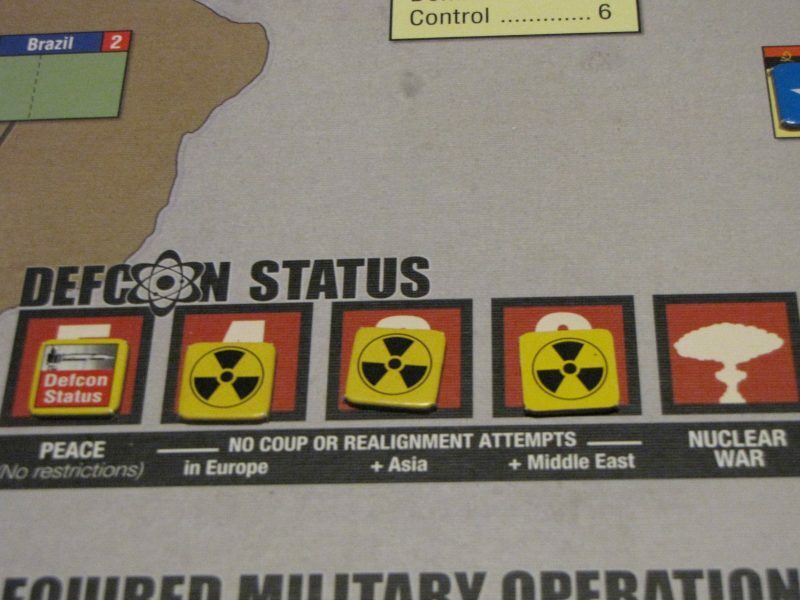 I’m not sure what this says for Twilight Struggle’s ranking as my top game. Am I clinging to it because I’ve had it as my top game for so long? I still appreciate its design a tremendous amount and I loved the plays I got in this past year, but I suppose I’m not quite as excited about it as before. It’s a staple in my collection and in my mind, but it’s lost some of that fresh sheen. We’ll see where I decide to put it when I re-do my “best ever” list in a couple of months. I didn’t play The Resistance at all in 2017. This is shocking to me, as I thought I’d gotten in a couple of plays. I always overestimate how many times I’ve played a game. We used to play this every week, but I think we wrung it dry. Right now I think I’d only be excited to play this one with some new people, in order to figure out my way in a different meta. Other games I rank highly that didn’t get any plays in 2017 are Through the Ages, which I think is a mistake because I distinctly remember the last time I played it, and it definitely didn’t seem like more than a year ago. But I could be wrong. Let’s also shed a tear for Agricola, whose owner moved to a different state before 2017. Barely anyone ever wanted to play it with me before anyway. It’s been more than a year for Battlestar Galactica–another game that’s kind of slipped away for us. I’d love to play this again soon, as long as everyone has a commitment to not take forever deciding crises. We had a couple of games where that really slogged everything down, which is a tragedy because it’s a great game. I played 96 different games in 2017, which means I played each game an average of 3.45 times. That’s a different game every 3.8 days, which is pretty amazing when I think about it. That compares to 78 different games that I played in 2016. This certainly supports the thesis that The Thoughtful Gamer has influenced me to be more of a “breadth” instead of a “depth” gamer. Consider also that of the games I played in 2016, I played 49% of them at least three times. In 2017 that figure plummets to 33%. I think I want to increase that number in 2018. I don’t want to be someone who always hops from new game to new game. I want to seriously reduce the number of games I purchase this year and make sure I get to play more the games I already know I love. I’m going to be more picky about which review copies I take, because I feel like I can afford to do that while still providing a great number of reviews for you all. What are your goals for 2018? Are you doing a 10×10 challenge or something similar? Are you going to try to play games more frequently, or are you satisfied with your habits right now? If you also kept track of your plays, did you find out anything interesting when looking at the figures? Let me know below! I wish I were better at tracking things, what do you use? just the BGG website? Yeah just the BGG website. I know there’s a cool app that can do more stats but last I heard it wasn’t out for Android. Around 700 plays face to face, of the 300 different titles played 146 or so games were new to me. 10+ plays: Dominion, Kingdomino, Viticulture, Herbaceous, Risk: Star Wars and Roll for the Galaxy. I use BGG to record plays, but I’d like a more detailed system. I had to count new titles just by looking at the year’s list and trying to remember which were new to me. Maybe I just can’t use the site’s full potential. For 2018 I decided to pass doing my own 10×10 challege and instead opted to share my wife’s 5×20. Two people in the same household doing their own challenge proved to be too restricting. Impressive! Is the 5×20 twenty plays of five games or the opposite? What games did you choose for that? 20 games, each to played 5 times.Our list consists mostly of games that have been sitting on shelves and not getting much plays even though they are fine: Corto, Card City XL, Mottainai, Oh My Goods!, Fugitive, Puerto Rico, The Manhattan Project, Star Realms, Thebes, Shipyard, The Castles of Burgyndy Card Game, The Valley of Kings, Archaeology: The Card Game, Paperback, Le Havre, Brew Crafters, Samurai, Magnum Sal, Bullfrogs and Zena 1814. We seem to have classics, deck builders and a strange Egypt theme going on. And because it’s my wife’s list, heavily euros…. It’s always a good goal to have, especially since those involved historical games are so rewarding. Haven’t even heard of Friedrich before. I’ll have to look into that one. Could not agree more! As for Friedrich, it’s a delicious blend of straightforward rules, elegant maneuvering and the constant fear that your opponents find out your hand of combat cards is not as strong as you’d like. Sounds like a description of Sekigahara. Definitely my kind of game. I’m planning to keep a log for the first time this year. In 2017, the game I’ve gotten into the most is Takenoko. Playing online with much better players has shown me its great depth and balance. Probably 100 games on BGA and 15 live. Perfect game that I think will remain in my top 20. Theme and rules are accessible to kids, and it plays all the way from friendly to cutthroat levels. Scythe was still the go-to game for my main extended game group in 2017, which I’m perfectly fine with. It’s an outstanding game, hasn’t gotten old, and it’s palpable how much better we’ve all gotten, upping the tension. The biggest hit that I bought myself was Tyrants of the Underdark. It still might not make my top 10 deckbuilders, but I like the theme and can appreciate how accessible it is. Since it’s capped at 4p, I started letting others play and getting in on whatever other game was going on. I also spent maybe 8 or 10 nights playing a 2p game against myself, which helped me fine tune the various strategies a little bit. Played a bunch of Spyfall and Resistance: Avalon, both to open game nights and in a couple of late night drunken marathons. Spyfall remains my favorite party game. Codenames, which I also played quite a bit, gets more and more cerebral and intensely competitive with my friends and family. Late in the year, found a few people who love Broom Service, one of my favorite games, and got in around 7 plays. My niece and nephew (8 and 10) love Mysterium, and I’ve played will all adults in the extended family as well. Maybe 12 times. My Summoner Wars has mostly moved into online and app tournaments, so my very heavy box collects dust. I wish I were closer to a live opponent. I miss the focus of live play and the feel of physical dice.